Dress this curly-haired moppet in 8 different traditional Irish costumes — among them, the long gown of a medieval entertainer, a hooded "Kerry" cloak, an Irish step dancer's colorfully embroidered dress, a 19th-century outfit based on an English milkmaid's costume, and four others. 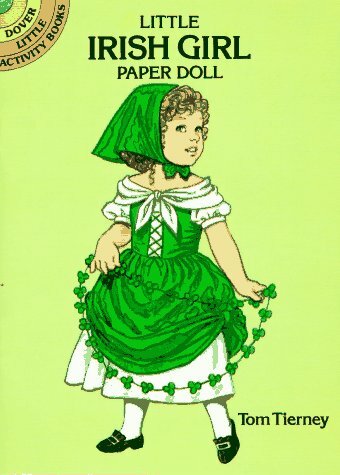 l paper doll and 8 full-color costumes. One of the leading authorities on fashion history, Tom Tierney created over 150 paper doll books for Dover Publications. With subjects ranging from U.S. Presidents to popular movie stars, Mr. Tierney's books are famous for being carefully researched and meticulously rendered. His releases are prized by fashion professionals, collectors, and paper doll lovers all over the world.